DC’s Bluejacket brewery, a go-to hangout for Nationals fans. Photograph by Scott Suchman. The Nationals are kicking off the 2019 baseball season this Thursday, March 28 at 1:05 PM versus the New York Mets. Restaurants and bars near Nationals Park are rolling out food and drink specials to keep fans fueled up before, during, and after the game. Also don’t forget to check out our guide of what’s new to eat and drink inside the stadium. In honor of the Nationals vs. Mets rivalry, the pizzeria’s riverfront location is pitting brews from DC Brau against beers from New York. The restaurant is open at least two hours before the first pitch of every home game for stellar pizzas and Italian-American dishes, steps from the stadium. The Navy Yard brewery is pouring hoppy beers starting at 10 AM for the opening, including the Perfect Places IPA that comes in a special can for an Opening Day souvenir. Pair brews with offerings from the outdoor grill like cheese-stuffed burgers, smoked wings, and chicken kebabs. During the pre-season, the bar turned lemons (Bryce Harper leaving DC) into lemonade (donate Harper gear for a free shot). Now they’re kicking off Opening Day early with doors opening at 9 AM and deals like $20 buckets of Budweiser and Bud Light. Atlas Brew Works is taking over the beer garden on Barracks Row for opening day starting at 11 AM. Sample a beer from the local brewery to show your DC pride and order a liter of the Blood Orange Gose for $11. Ring in the new season with live music by the 19th Street Band steps away from Nationals Park. The outdoor venue right by the front gate is bringing back their game day happy hour deal: All drinks are $5 from the start of the third inning to the end of the seventh. Eat a sundae out of a mini baseball helmet at Ice Cream Jubilee. Photograph courtesy of Ice Cream Jubilee. For a post-game meal deal, head to chef Haidar Karoum’s Navy Yard restaurant for a $48 menu-for-two, available from 5 to 6 PM. The meal features a crispy cauliflower appetizer, spice-roasted chicken served with toasted chili-lime dipping sauce, salad, and dessert. There’s drinking by the water, and then drinking on the water. The satellite bar on the pier near this Southern restaurant opens at 11 AM with a full bar, barbecue, and more. For scoops with spirit, head to the homegrown ice cream shop for the return of the Nats Red Velvet flavor. 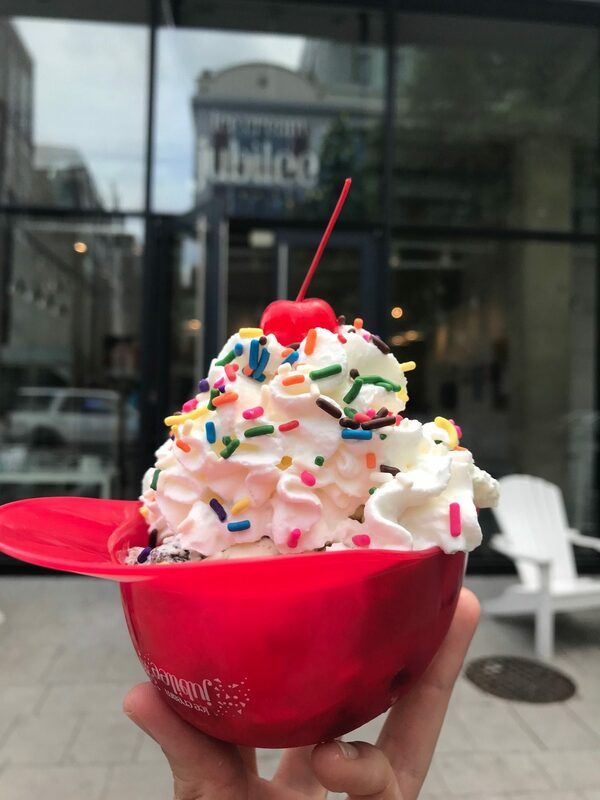 At Navy Yard, indulge in baseball helmet sundaes for 20% off until 7 PM, or come into both locations rocking a Nationals hat or shirt for a 10% discount. The massive new Mexican restaurant near the front gates isn’t typically isn’t open for lunch, but opening day is a different story. Doors open at 10 AM with all-day specials like $3 chorizo sliders and $8 quesadillas. Drink deals include $5 Estrella drafts, $6 select cocktails, and $7 Mission margaritas. The Tommy Show will broadcast live from the new patio. The restaurant is also accepting donations of old Bryce Harper gear for charity. All day happy hour means $5 beers, $7 draft wines, and $7 cocktails for the first game of the season. Grab a drink to wash down house-made pastas and sandwiches for a pre-game lunch. These veteran-owned bars on Barracks Row are offering free shuttle service to the game for customers via the “Mug Bug.” Pre-game starting at 11 AM with specials like $4 Miller Lite, $5 Blue Moon (only available at The Ugly Mug), $10 to $11 barbecue and hot chicken sandwiches, $2 tots, and more.